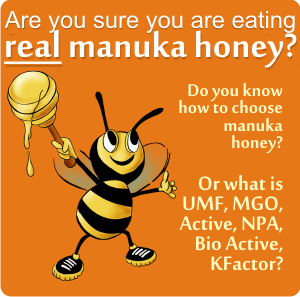 What are the health benefits of eating honey from Malaysia? 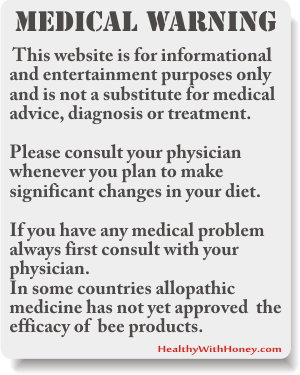 The health benefits of eating honey cannot be comprised in a single article, that’s why this website was born. But here are some of the health benefits of natural honey found in Malaysia, a country with monsoons, rainforest and different kinds of bees. 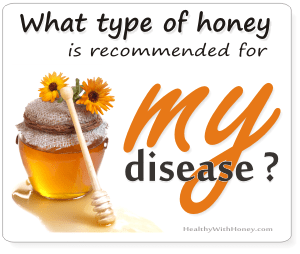 The phrase “medicinal honey” refers to honey in general and also to “medical grade honey“. Malaysia is proud of having 3 exceptional types of medicinal honey: tualang, gelam and kelulut honeys, all produced by wild bees. (the first 2 by Apis Dorsata and the third by Trigona spp.) They are all considered medicinal honeys and science confirmed it. see What types of honey can we find in Malaysia? • The study In-Vitro Screening Of Malaysian Honey From Different Floral Sources For Antibacterial Activity On Human Pathogenic Bacteria from 2014, analyzed 4 types of Malaysian honey and concluded that Gelam honey possesses the highest antibacterial effect among the tested Malaysian honey samples. Durian honey failed to produce substantial antibacterial activity, whereas Tualang and Gelam honey showed a spectrum of antibacterial activity with their growth inhibitory effects against all of the tested bacterial species including vancomycin-resistant enterococci (VRE). – tualang (a wild polyfloral honey produced by Apis dorsata located on one of the tallest tropical rainforest trees from species Koompassia excelsa) against Staphylococcus aureus, Bacillus cereus, Escherichia coli, and Pseudomonas aeruginosa. The results show that gelam, kelulut and tualang, have high antibacterial potency derived from total and non-peroxide activities, which implies that both peroxide and other constituents are mutually important as contributing factors to the antibacterial property of honey. Kelulut honey has quantitatively poor but qualitatively excellent antibacterial potency. Gram-positive bacteria proved to be more susceptible to Malaysian honey compared to Gram-negative bacteria species. • The study Ellagic acid, phenolic acids, and flavonoids in Malaysian honey extracts demonstrate in vitro anti-inflammatory activity, by Mustafa Kassim Abdulazez Kassim et al published in 2010 in Nutrition research, evaluated the anti-inflammatory activity of Malaysian honey and showed that honey ethyl acetate extract (HEAE) exhibited greater activity in vitro, whereas honey methanol extract (HME) contained a higher concentration of phenolic compounds per 100 g of honey. The major phenolics in the extracts were ellagic, gallic, and ferulic acids; myricetin; chlorogenic acid; and caffeic acid. Other compounds found in lower concentrations were hesperetin, p-coumaric acid, chrysin, quercetin, luteolin, and kaempferol. Malaysian honeys a full of vitamins and minerals. Based on an in-depth study led by Mohammed Moniruzzaman et. al., BioMed Research International Volume 2014 reported that Malaysian honeys were rich sources of minerals, namely sodium, potassium, calcium, magnesium, iron, and zinc. 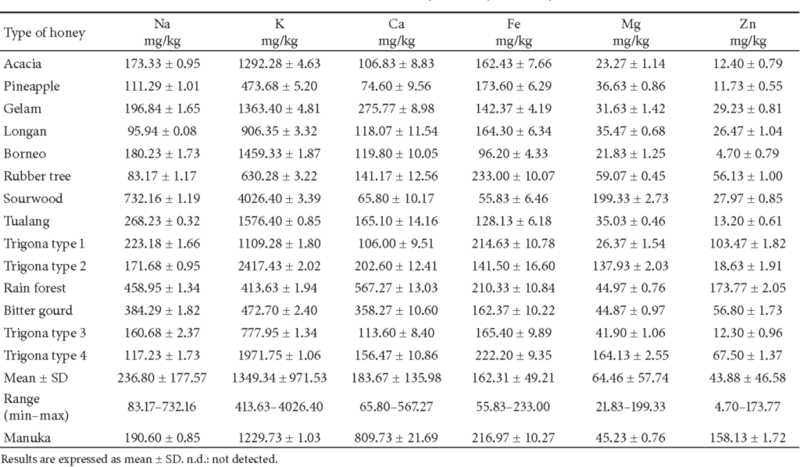 mineral content of some Malaysian honey, after Mohammed Moniruzzaman et al., 2014. source. • The study Antioxidant capacities and total phenolic contents increase with gamma irradiation in two types of Malaysian honey, by Saba Zuhair Hussein et al., 2011, analyzed the antioxidant activities and total phenolic and flavonoid contents of 2 Malaysian honeys: gelam and nenas (pineapple), in 2 situations: before and after gamma irradiation. 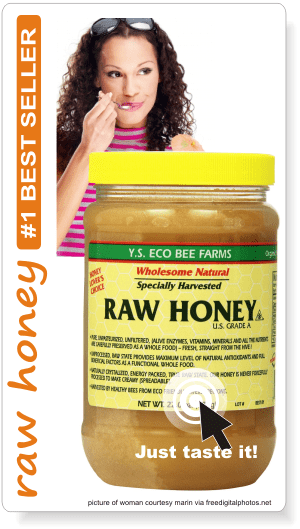 The results showed that both types of honey can scavenge free radicals and exhibit high antioxidant-reducing power. Gelam honey exhibited higher antioxidant activity (p < 0.05) than Nenas honey, which is in good correlation (r = 0.9899) with its phenolic contents. Most interesting was the fact that after gamma radiation both honeys had higher antioxidant activities and total phenolic and flavonoid contents. The phenolic compounds such as: caffeic acid, chlorogenic acid, ellagic acid, p- coumaric acid, quercetin and hesperetin as indicated by HPLC method were found to be higher in Gelam honey versus Nenas honey. In conclusion, irradiation of honey causes enhanced antioxidant activities and flavonoid compounds. This is the case of all medical grade honeys, which undertake gamma radiation. – antiradical activity by DPPH assay was 41.30 ± 0.78 (% inhibition). The data confirms that the antioxidant properties of gamma irradiated Tualang honey are similar to other types of honeys reported in the literature. • 4 types of Malaysian honey: gelam, longan, rubber tree and sourwood honeys were compared to manuka honey regarding their physicochemical and antioxidant properties. • Another study compared 3 honeys: acacia, pineapple and borneo with tualang honey. The results showed that tualang honey contains the strongest antioxidant properties by far! see Gelam honey makes the cancer cells commit suicide! • The study from 2010 Antioxidant protection of Malaysian tualang honey in pancreas of normal and streptozotocin-induced diabetic rats., by Omotayo Owomofoyon Erejuwa et al., demonstrated that tualang honey ameliorated renal oxidative stress and produced hypoglycemic effect in streptozotocin (STZ)-induced diabetic rats. The study’s conclusion was that the hypoglycemic effect of tualang honey might be attributed to its antioxidative effect on the pancreas. 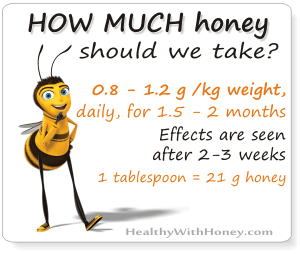 • The 2009 study Two varieties of honey that are available in Malaysia gave intermediate glycemic index values when tested among healthy individuals., by Sathyasurya Daniel Robert et al., determined the glycemic index (GI) of Malaysian wild honey and Australian honey. Eight healthy volunteers participated in the study and the results showed that the mean AUC of the Malaysian and Australian honeys, 174+/-19 and 158+/-16 mmolxmin/l, respectively, did not differ from each other but were significantly less than that after glucose, 259+/-15 mmolxmin/l (P<0.001). The mean GI of both types of honeys were significantly less than the GI of glucose, 100 (P<0.001). – mean GI of Australian honey: 59+/-5. • The study Hypoglycemic and antioxidant effects of honey supplementation in streptozotocin-induced diabetic rats, by Erejuwa OO et al., from 2010, showed that honey reduces hyperglycemia and ameliorates oxidative stress in kidneys of streptozotocin-induced diabetic rats. Lose weight with Malaysian gelam or acacia honeys! • Gelam and Acacia honey were investigated in a study from 2017, regarding their efficiency in reducing excess weight gain and other parameters related to obesity. The study used male Sprague-Dawley rats which were induced to become obese using high fat diet (HFD) prior to introduction with/without honey or orlistat for four weeks. Significant reductions in excess weight gain and adiposity index were observed in rats fed with Gelam honey compared to HFD rats. Moreover, levels of plasma glucose, triglycerides, and cholesterol, plasma leptin and resistin, liver enzymes, renal function test and relative organ weight in Gelam and Acacia honey treated groups were reduced significantly when compared to rats fed with HFD only. Is tualang honey (aka rainforest honey) an alternative treatment for breast cancer? Similar results were also displayed in rats treated with orlistat, but with hepatotoxicity effects. In conclusion, consumption of honey can be used to control obesity by regulating lipid metabolism and appears to be more effective than orlistat. What types of honey can we find in Malaysia? What is nenas honey? Yes, this is exactly how it is done. The black seeds should be put in a pan, on a very low heat and kept for a few minutes, till the seeds are heated (but not burnt) and the specific smells goes away. Then let them cool and grind them in a coffee grinder. As for dose, please read this: Do black seeds really cure HIV? Some case reports may help!